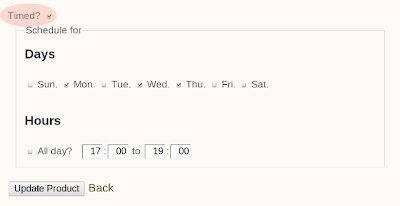 Until now one of Ordys' features allowed you to set up your dishes or whole categories for a particular day/days of the week and hours of the day. It's a useful tool for all businesses which have "Lunchtime menu" or "Breakfast specials" positions on their menus. In general, it was designed for any additional menu items which are not available all day. Now you can do the same with your promotions! The system will automatically activate and apply scheduled offers to all orders during chosen times - for example 10% off on Monday, Wednesday and Thursday from 5pm-7pm. Using that feature you can encourage your customers to order from you during your quiet days/times. If you leave "All day" section ticked when entering your promotion it will appear on your menu all the time during chosen days. Look for the "Timed" section ( circled on the image below ) on the product / promotion creation page. Tick it to get the screen where you can choose days and hours.